Half of those surveyed believe Intel when it claims that it's standing behind Itanium. Some of this is probably due to Intel starting to pull the covers off the next version of Itanium (dubbed Poulson), which is due next year. Intel has also disclosed a bit of information about the Kittson follow-on that should come out in 2014. 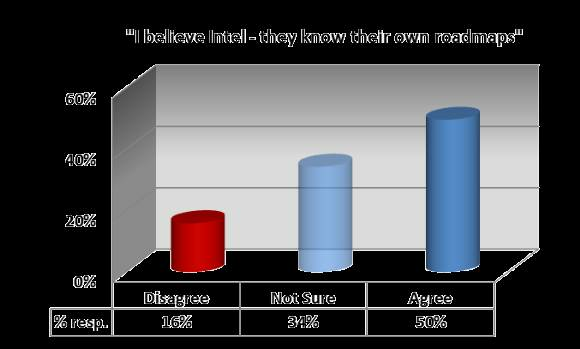 A third of respondents aren't totally sure, and only 16% say that Intel isn't telling the truth about its future Itanium plans and products.